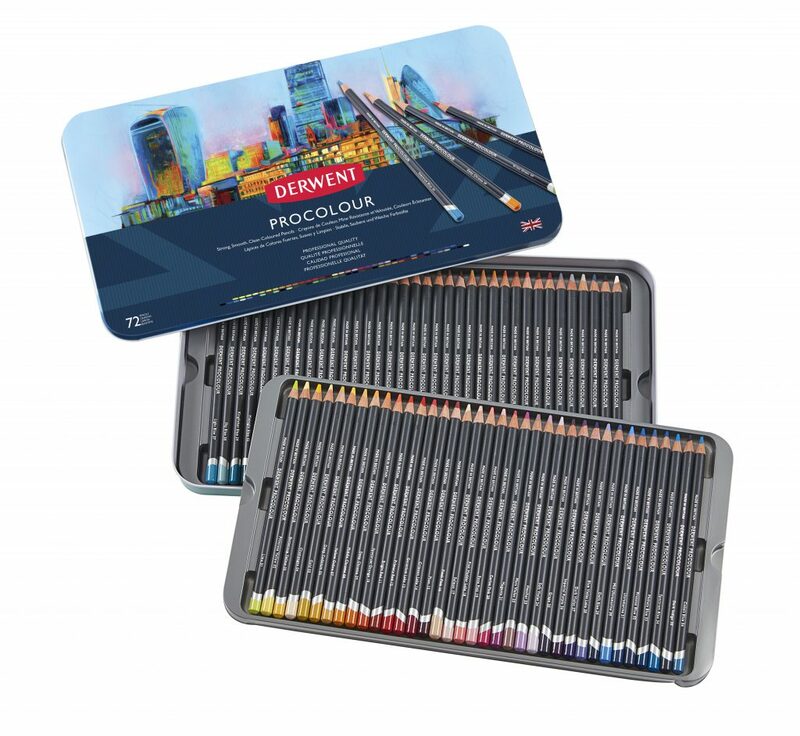 From the moment I was asked to work with Derwent on the new Procolour range, I was extremely excited to put pencil to paper – especially with a pencil so vibrant that blended so well. First of all, I pondered on how to make full use of all the rich colours in the collection, maximising on their blendability, smoothness and scope for fine detail. My thoughts began with finding a narrative to tie the brand – a well-known, much-loved staple of the art material world with a heritage dating back to 1832 – to an equally impressive image which would be striking and instantly recognisable on the shelf. As such, I chose a selection of British architecture, including The Gherkin and The Walkie-Talkie. These are now such iconic landmarks of the London skyline and are known throughout the globe, much like Derwent has been for generations. To create a unique composition, I first began building a collage in Photoshop. Once happy with this one-of-a-kind perspective of London, I turned the saturation on my computer up to the maximum to create eye-catching and bold colours – similar to those that you can create with Procolour. This created an image that blossomed with rainbows, but not too psychedelic. I wanted each person to see something familiar the Procolour tin but, at the same time, something that took them away from what they expected. The variation of shades in my art have all come directly from mixing and blending the selection of 72 pencils on offer in the range, but, unlike a lot of online tutorials tell you too, I didn’t begin with light shades and then add darker colours on top. My view on working with Procolour is to be bold and chaotic with your artwork as it gives a real sense of photorealism. There are no steps to creation, no flat-pack formula, so I set about with blending and creating colours with Procolour. And, although it looks incredibly smooth on the tins, none of the finalised image is computer generated. The light blue background of the image has been made incredibly smooth by the texture of Procolour, whilst the detail within each of London’s office has been made with the incredibly sharp point that you can achieve with Procolour. However, one of my aims when setting about on creating this fantasy version of London was to use every colour in the palette. When looking at the tin of your Procolour, you’ll notice pinks, blues, purples and yellows scattered throughout. You may not be able to pick out the browns and greens but they are within the composition of the image, creating a sense of depth. And, like Procolour, my artwork draws joy from colours – from their emotions and their variations. Even for an experienced artist like myself, it was a highly rewarding experience seeing what this range can do. Once the artwork was finished, I even mocked-up a tin with my drawing to ensure it look right amongst Derwent’s other ranges. That was fantastic fun and definitely something you should try at home, by imagining that your artwork will appear on a Derwent tin. 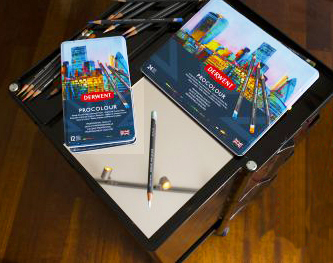 And, if you pick up a tin of Procolour, you can create your own unique artwork, worthy of any Derwent tin. The range has a whole host of bold colours that can be blended easily and, with a dust-free composition, you can be confident that your art is perfect every time! I love the Derwent colors, they blend nicely and are quite versatile! I especially enjoy the tins, actually I love the tins, I am a huge fan of keeping my pencil crayons in tins to protect them. I am constantly trying out new supplies and mediums.